As an independent magnet wire distributor for many sources and an authorized distributor for Essex brand magnet wire products, it should come as no surprise that Whitmor/Wirenetics's 30 plus years of experience place us far above the rest. In addition to providing NEMA MW 1000 magnet wire (winding wire), we offer numerous other related wire types: Litz wire, resistance wire, bare and plated wire, precious metals, and lockwire are all among our varied options. And, with sizes from 2 AWG through 50 AWG, half-sizes, and square and rectangular choices, you’re sure to find exactly what you're looking for. In addition to shipping from our Valencia, CA warehouse, we feature warehouses nationwide to make delivery that much easier-and we're certified to ISO9001 and AS9100 standards. Although our wires are aesthetically pleasing-with red, green, clear, and blue colors available-our magnet wires are also made to withstand a range of temperatures, from 105° C to 240° C. To accommodate multiple applications, we feature solderable, bondable, and high-temperature insulation types, as well as single, heavy, triple, and quad enamel builds. 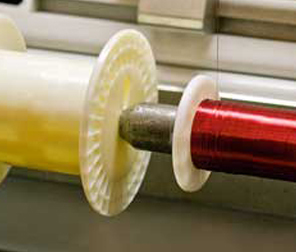 We also offer several winding wire types, including Rubadue single, double, and triple. Since applications have different requirements, our magnet wire can be manufactured from several materials to provide long-term, high-quality performance. Our copper conductors can be insulated with smooth, continuous enamel coating, and we can include aluminum or other conductors. Alternative insulations are also available, including fiberglass and fabric. At Whitmor/Wirenetics, you'll experience a big company's ability with a small company's response. We're happy to offer re-packaging for special quantities or spool sizes, and our secondary services, such as labeling and bar-coding, provide additional support. Test data is also available. To learn more about Whitmor/Wirenetics and our magnet wire products and services, please contact us today.